FRANKFURT, Germany — HARMAN’s Crown Audio today announced the introduction of the XLS DriveCore™ 2 Series two-channel power amplifiers, offering a host of upgraded features including more flexible DSP band pass filtering, selectable input sensitivity, remote power trigger operation and sleek new styling. Four new XLS DriveCore 2 models are available including the XLS 2502, XLS 2002, XLS 1502 and XLS 1002, with power ratings from 350 to 775 watts per channel at 4 ohms and 1100 to 2400 watts at 4 ohms bridged. Setting new performance and value benchmarks at their respective price points, Crown’s XLS DriveCore 2 Series amplifiers feature HARMAN’s exclusive DriveCore amplifier circuitry that combines high power output with exceptional energy efficiency, all under 11 lbs (5 kg). “The XLS Series has been a true industry workhorse and with the introduction of the XLS DriveCore 2 models, the amplifiers are even better suited for a wider range of live, portable PA and installed sound applications,” said Craig Lambrecht, Business Segment Manager, Crown Audio. Crown XLS DriveCore 2 amplifiers now offer a bandpass filter on each channel in addition to the previous low and high pass filters, enabling more precise DSP crossover tuning, loudspeaker matching and system EQ capability. All models allow the front-panel LED indicators (except the clip and thermal indicators) to be turned off if desired, reducing distraction in dark venues. All the amplifiers have selectable input sensitivity of either 1.4 Vrms or .775 Vrms, facilitating their use in a wider variety of applications and enabling the amplifiers to be driven at full power. XLS DriveCore 2 amplifiers now offer a remote power trigger function, to turn the amp on and off from a distance. The amplifiers also feature a display sleep mode that turns the display lighting off after a specified time. All models provide a security setting that disables the front-panel menu buttons; the menu is locked and unlocked by entering a simple button combination. In addition, a system reset function enables all factory settings to be restored. Power ratings of the XLS DriveCore 2 models (per channel into 4 ohms) are as follows: XLS 2502, 775W; XLS 2002, 650W; XLS 1502, 525W; XLS 1002, 350W. All incorporate Crown’s proprietary DriveCore Class D amplifier design, which is the size of a postage stamp yet combines the amplifier driver stage into the power output stage along with additional audio-signal functions to provide remarkably efficient, cool-running operation that conforms to HARMAN International’s GreenEdge™ environmental initiative. All the amps are just 2U rack spaces high. Crown XLS DriveCore 2 amplifiers can power 8- 4- or 2-ohm loads and can be bridged for 8- or 4-ohm mono operation. Additional features include Peakx™ limiters that deliver maximum output while protecting the speakers; balanced XLR, 1/4-inch and RCA inputs; touchproof binding post and Speakon® outputs and more. All Crown XLS DriveCore 2 amps are covered by a three-year, no-fault fully transferrable warranty. 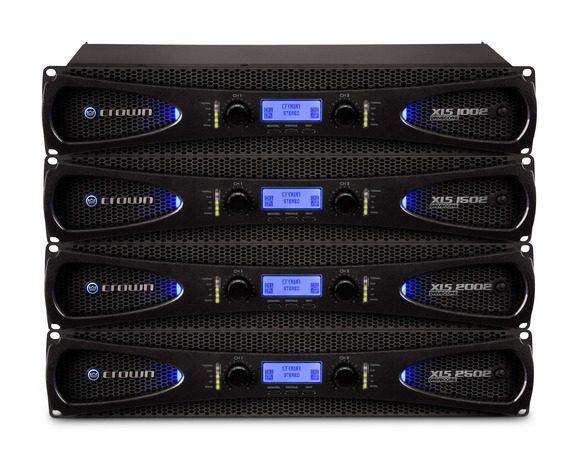 Crown XLS DriveCore 2 Series amplifiers will be available in June 2015 at prices ranging from $299 to $599. Learn more at www.crownaudio.com and join the conversation on social media with #BeHeardXLS.